The UK has voted to leave the EU. How does Brexit affect people traveling to the UK and vice-versa? Are UK citizens traveling to the EU affected? Are EU citizens traveling to the UK affected? Are UK/EU family members traveling both way affected? Are Commonwealth citizens traveling to the UK affected? Are other visa-free nationals (such as US/Canada citizens) affected? What other consequences might 'Brexit' have on travelers? Also, see the related post on Expats.SE. Post is related to a rapidly changing event. As of today, no. Nothing has currently changed (other than currency prices, which are of interest to international travelers). There will be a prolonged negotiating period over the next several years (specifically, two years after Article 50 is invoked unless a different agreement is reached), and immigration controls will inevitably be a large part of those discussions. The results of those negotiations, along with potential future events in the UK and EU, may bring any number of future changes for anybody, regardless of citizenship, interested in short or long-term travel to the UK and for UK citizens looking to visit EU countries. There are also no current plans for immigration changes for Commonwealth or other visa-free nationals (such as US/Canadian citizens). Until these negotiations are completed and implemented, the UK remains a member of the EU, and all existing laws apply with no changes. As changes are proposed and enacted, travelers will need to remain alert for potential effects. Bottom line: Tourists, visitors, and transit cases are not affected by the UK's vote to leave the European Union. 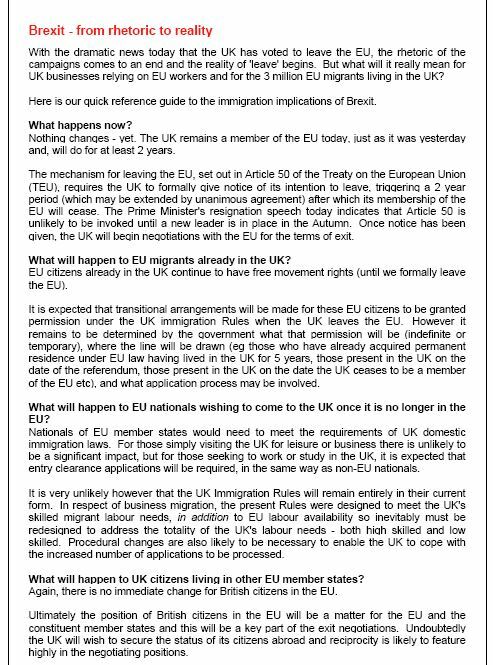 The relevant issues are about asylum seekers and some types of EU nationals who seek to gain (or persist) settlement in the UK. If you are an EU national exercising derived rights or exercising treaty rights, please use Expats for your questions/answers. The Home Affairs Committee published a report dated 27 July 2016, The work of the Immigration Directorates (Q1 2016), which concludes there is an "absence of certainty" over Brexit. It mainly deals with the status of EU nationals who are now exercising treaty rights in the UK. Repealing and Reviewing Domestic Legislation—As part of the process of leaving the EU, decisions would need to be made about how to deal with existing domestic legislation passed to enable EU law to have effect in the UK, a process which the House of Lords European Union Committee has described as "domestic disentanglement from EU law". Parliament would have an important role to play in reviewing, repealing, amending and replacing legislation, a process which is predicted by many to be complex and time-consuming. Once the UK had formally triggered Article 50, its timescales would apply independently of Parliament approving domestic legislative changes associated with leaving the EU. The full briefing is here. The House of Commons has admitted a research paper to their library: "Leaving the EU: How might people currently exercising free movement rights be affected?" On the 24th of June this paper was admitted: "Brexit: what happens next?" Now that the UK has voted to leave the EU, what will happen next? 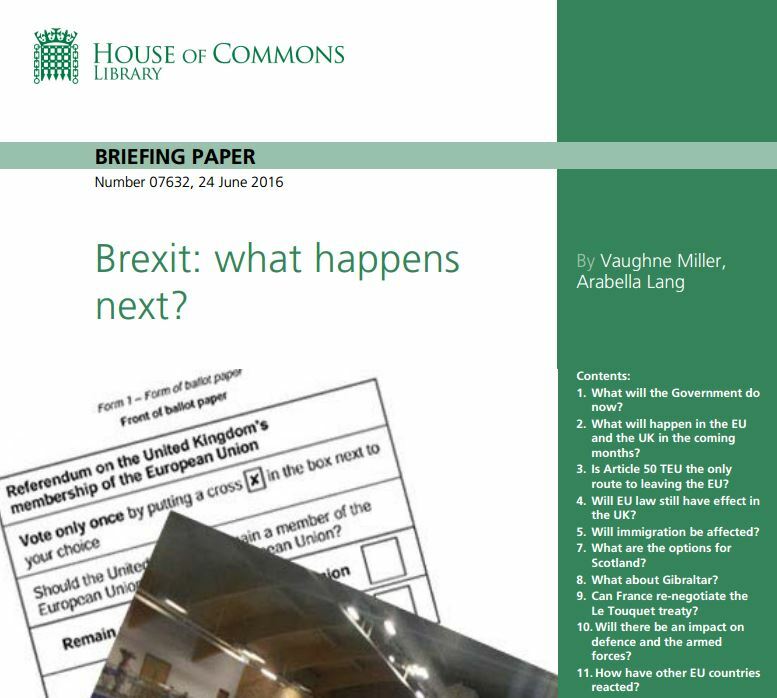 This Commons Library briefing paper looks at the immediate consequences of the vote and some of the longer term implications. This paper considers various questions about UK withdrawal from the EU and what is likely to happen in the coming weeks and months. The issues include the method of leaving the EU, continuing parliamentary scrutiny of EU business and the withdrawal negotiations, and the implications of Brexit for Scotland and Gibraltar. Spouses and long-term workers will most likely be grandfathered. There are no mass deportations of EU nationals envisioned. See also: How will Brexit affect your finances? The Surinder Singh route. They never liked this ruling and it has acted as a thorn in the government's side for a long, long time. It's in the crosshairs and I think we can be sure that this immigration route will be closed, perhaps not this year, or even this decade, but it will be high on the list of priorities. The Zambrano case. This is another case that never sat too well with the government. The government (two governments actually) were recalcitrant following the court's decision and it took a long time for them to even publish the guidance. The Metock case. The UK's reaction was heated and recalcitrant but they finally implemented the ruling. Brexit advocates have seen this case as an extension of Singh (above) and hence a humiliating loss of sovereignty. There are other rulings from the European Court that are similar and the UK has fought against them and opted out where they could. These things affect boyfriends and girlfriends in long-distance relationships where they need an inward migration route because they cannot meet the rules. And overall these are about family formation and do not affect travellers and holiday makers to the UK. Remember that part of the mission of UK Visas and Immigration is to get lots of visitors in to the UK because the UK economy relies upon visitors, and this part of their mission will not change. If anything they will expand programmes like they are doing for China and India. The UK has voted to leave the EU. How does this affect people traveling to the UK and vice-versa? The outlook for tourists visiting the UK looks great! Sterling is at an all-time low so holidays will be cheaper, and visitors will be especially welcome because it boosts the economy. No change. The UK has always operated at arm's length from the Schengen system. In about 4 or 5 years you will see the "EU Nationals" queue at the airport become rebranded into something that does the same thing but without the EU logo. And the EU rules about what you can carry and the HMRC customs declaration exits will be rebranded. It's reasonable to expect the government to adopt the EU customs rules into UK law. But this will (most likely) be done by statutory instrument so nobody will notice the change. The first change a traveller is likely to see will be in the duty-free shops. Unless renegotiated, customs limits are likely to be introduced and of course any EU branding will be removed. Note: maybe you like the Singh Route, maybe you don't. Maybe you agree with what the government will do, maybe you don't. The point being that it's in the cross-hairs and there are strong public expectations that something will be done. Side note: It's also reasonable to expect that EU citizens who have been here for a long time will be grandfathered in one way or another. Removals/deportations of people who are working in the economy is not in scope at all. The practicalities and mechanics of actually reversing Singh are out-of-scope. The point being that the "immigration debate" surrounding Brexit was not about tourists and visitors. Nothing for quite some time. No law has changed. This was merely a non-binding referendum. Presumably the executive will agree with the people and Article 50 will be triggered by the PM, but even then, this is the first time it's ever happened so 1) it'll take a couple of years to sort out and 2) people aren't exactly sure how it'll happen. As a result - the UK is still in the EU, no laws have changed yet, so for now the only way it might affect you is the exchange rate - the British pound has plummeted with the news. As far as the EU treaties are concerned, the referendum does not cause a Brexit. To cause a Brexit, the PM has to officially inform the other EU members that the UK is leaving. This notification may be several weeks or months in the future. The two-year period mentioned later starts at that point. With this notification, the official negotiations on the future relations between the UK and the remaining EU nations begin. They can end in different ways. If there is an agreement between all parties, they can sign it and decide when it will take effect. Presumably this would include new treaties on travel, commerce, etc. If there is no agreement after two years of negotiation and both sides agree to extend the negotiations, they may do so. If there is no agreement after two years and no agreement to continue negotiation, the Brexit will take effect. There would be no new treaties on travel, commerce, etc. So in theory the Brexit could take effect the day after tomorrow. In practice this is highly unlikely. The brexit could take effect at any time in the future, if talks drag on but do not fail completely. The Brexit agreement would define the new rules and their starting date. I cannot believe that either side would enact significant changes for tourists on short notice. Also, I consider it probable that there would be reciprocity in the new rules. Since the UK would not want to disrupt the Common Travel Area, visa-free travel would have to remain possible. The right to work would likely change, but that's for Expatriates.SE. It is too early to tell if anything at all will be affected; since the referendum is just a notification of the will of the people. It is up to the government to act on it and initiate proceedings. If the UK does proceed with the legal process of divorcing from the EU, it may be able to negotiate separate agreements that can have an impact on the freedom of movement. Nothing will happen for at least the next two years; because that's how long it will take for the famous Article 50 to kick into effect. Even then, individual agreements/concessions may be negotiated by the UK with the EU regarding the freedom of movement. For people that currently need a UK visa who are non-EU citizens, there will be no change in their situation. For EU citizens, unless there is reciprocal agreement between UK and that particular EU member state, or UK and the EU in general regarding freedom of movement, you may need a visa to travel to the UK. Any special concessions or waivers that were in place regarding importing of goods and any import fees - these may be affected if the UK is removed from the EU - as it would not be part of the single market. However, again, the UK may manage to negotiate to keep these agreements with the EU. Not the answer you're looking for? Browse other questions tagged visas uk eu event-based-effects visa-free-entry or ask your own question. Does the UK know whether I am currently there or not? What would Brexit mean for my immediate Europe travel plans from the UK? Does the US governmental shutdown affect traveling to/from the US and if so, how? Is it becoming illegal for a Canadian citizen to enter Canada presenting a foreign passport? EURO 2016: floods, mass protests, state of emergency… What are the consequences for visitors? Here are my ties to my home country. Do you think they are enough? How can I prove them? With an aufenthaltskarte, can I visit the UK with my EU citizen wife? Do I need to prove that my spouse is using their right of free movement in order to receive a family member Schengen visa?